A murder-suicide case can, under certain circumstances, lead to a wrongful death claim. The spouse or heirs of a murder victim may file a claim against the personal representative of the alleged at-fault party’s estate. At Giometti & Mereness P.C., we are experienced both in representing the beneficiaries of alleged victims and in defending the estates of accused slayers. A number of issues can develop in a wrongful death case arising out of alleged murder-suicide that can delay and complicate the resolution of a dispute. Issues of insurance coverage will arise if it is alleged or the circumstances show that the victim’s death was the result of an intentional act. Sometimes it is questionable whether the case is really one of murder-suicide as opposed to a mutual suicide pact or a crime committed by an intruder. To learn more about murder-suicide and wrongful death claims, call or e-mail us to schedule an appointment. What evidence do the police have to make their conclusion? What is the apparent motive? What are the results of the autopsy? What is the credibility of eyewitness statements? What does the firearms and ballistics evidence show? What does the DNA evidence show? At Giometti & Mereness P.C., we know wrongful death claims inside and out. Call or e-mail us to learn more about murder-suicide cases and wrongful death claims in Colorado. Want Answers to Questions Regarding Wrongful Death? Click on the image below to check out our NEW e-book! Trial results confirm we are among the best trial lawyers in Colorado in handling wrongful death, bodily injury, property damage, uninsured/underinsured motorist, insurance coverage and insurance bad faith litigation. We literally “wrote the book” about Colorado wrongful death law. 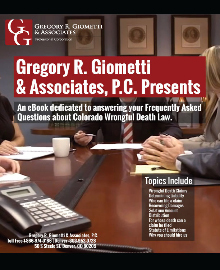 See our Publications to learn more about our book G. Giometti, Colorado Handbook of Wrongful Death Law (3rd Ed. 2015). 4th Addition coming in early 2019! For years attorneys throughout the state have contacted our firm for guidance in handling wrongful death claims. Contact us to benefit from our experience. We also “wrote the book” about insurance bad faith law in Colorado. See our Publications to learn more about our book G. Giometti, Colorado Law of Insurance Bad Faith (4th Ed. 2015). We are highly experienced in analyzing complex insurance coverage issues, pursuing declaratory judgment actions, and litigating bad faith claims arising out of coverage and claims handling disputes. We also “wrote the book” about motor vehicle accident litigation and insurance in Colorado. See our Publications to learn more about our book G. Giometti, Colorado Automobile Accident Litigation & Insurance Handbook (3rd Ed. 2018). We are experienced in handling all types of motor vehicle accident cases, particularly those involving traumatic brain injuries and spinal injuries. © 2019 Giometti & Mereness P.C.